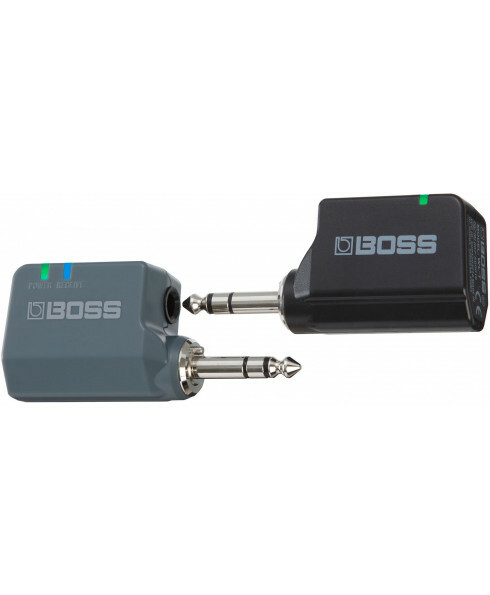 Sistema Sem Fio Boss WL-20L Wireless System. The WL-20L model is functionally identical to the WL-20, with the exception that it eliminates cable tone simulation. The WL-20L model is functionally identical to the WL-20, with the exception that it eliminates cable tone simulation. This makes it the best choice for instruments where cable capacitance has little or no effect on the tone, such as an acoustic/electric guitar with an onboard preamp, a guitar or bass with active pickups, or a line-level device like a keytar or Roland’s Aerophone digital wind instrument. The WL-20L also works great with passive pickups if you don’t need the subtle treble roll-off provided by cable tone simulation. If you’re looking to bring wireless freedom to your pedalboard, check out the WL-50. Equipped with the same high-performance wireless tech found in the WL-20 and WL-20L, the stompbox-size WL-50 features an integrated transmitter dock, two cable tone simulation options, and a DC output for distributing power to one or more pedals. *1: Use a standard USB AC adaptor (5 V/over 0.5 A) for charging.